Dark Legion Comics announces GUN GHOUL #1: Raising the Dead by Will Caligan. Will Caligan is the military veteran who was deplatformed by SJWs at his publisher earlier this year. He is now publishing with Dark Legion Comics, which will be releasing his Gun Ghoul and Techlore comics this fall as well as working with him on his new projects. This looks like it will scratch an itch. Will buy. 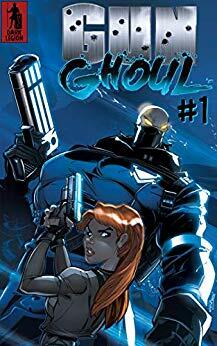 Since this is Dark Legion comics, I can infer that the story about Gun Ghoul will not be set in the AltHero setting. Looks very cool and I will pick up a physical copy. Is there a print version? I didn’t see one on amazon or aerbook. No physical copy yet, I am just anticipating for next month or so. According to Vox’s Darkstream, the plan is to release all four issues electronically, and then release a trade paperback for the set.